Bluetooth connectivity is a staple of daily personal communication and entertainment these days. The commercial A/V business was slower to adopt, and for good reason. Poor connectivity, a lack of consistent user experience and garbage audio quality plagued Bluetooth devices early on. Those issues have largely been addressed (with a few exceptions) and the users of commercial AV systems have come to expect Bluetooth connectivity to their conference rooms, entertainment systems, business music systems, etc. Techrep has no fewer than 6 different ways from 3 manufacturers, so get a high quality Bluetooth link to your commercial A/V system. Keep these in mind while you are working through your next design! Every salesperson at Techrep carries a Switchcraft 318BT in their bag. It might possibly be the most convenient way to get connected via Bluetooth, especially when it’s “spur of the moment.” The 318BT uses Switchcraft’s AudioStix form factor which is compact and extremely rugged. One end of the 318BT has a male XLR connector that plugs into any XLR input. The other end is a Bluetooth antenna. The 318BT can be powered using your console’s phantom power OR via a 5v micro USB input on the side. The Bluetooth connection to your device is a Bluetooth 4.0 stereo headset device link, but inside the 318BT, the left and right channels are summed together to make a single mono output. 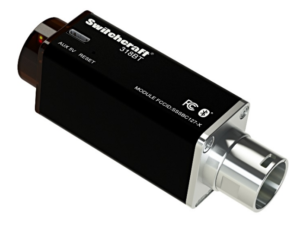 This makes it convenient to plug into a single input channel on your console or powered loudspeaker. PreSonus AR and StudioLive Series III consoles both have Bluetooth inputs that are easily setup from the master section of the mixer and can be used like an aux input to your mix. on the AR mixer, pairing your device could not be easier. Hit the bluetooth button to turn the feature on and hit the pair button to enter pairing mode. 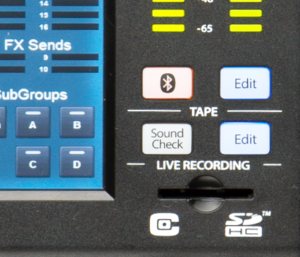 On the StudioLive Series III, the Tape In can be fed from the SD Card, USB, the AVB network or the Bluetooth link. 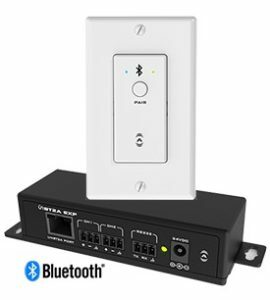 unBT2A – The unBT2A is a high quality decora mount Bluetooth receiver that connects to an audio/control breakout box via a cat5/6 cable. That connection is NOT a network connection, however the Bluetooth front end of this device is the front end for the network endpoints mentioned below. 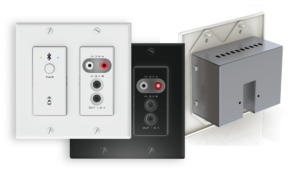 The unBT2A is an elegant solution for a permanent install, commercial or residential. It give the use easy interface access without going into a rack or cabinet and it’s a familiar interface to most people. unA6IO-BT & unD6IOBT– These models are actual network endpoints that will send multi channel audio ingested at the wall plate to your DSP or mixer via either AES67 (unA6IOBT) or Dante(unD6IOBT) protocols. To expand even further on the capabilities that being a network endpoint afford, there are native plugins available to control these devices from QSC and Symetrix DSP processors. Having that sort of native control, allows you to give the user the necessary control via the same interface that they are using for the rest of their system. If you aren’t convinced already and you would like a demo or a chance to test any of these product, please call or email us and we will be happy to help make that possible. Email sales@techrep.com or call us at 440-327-1624.